A unique way to camp out in the wild. The GrandLodge is the luxury version of the spherical-shaped, inflatable products offered by CasaBubble and consists of a half opaque pod connected to a completely transparent one. The bubbles are inflated and maintained with a silent air turbine which also circulates fresh air through the bubble. 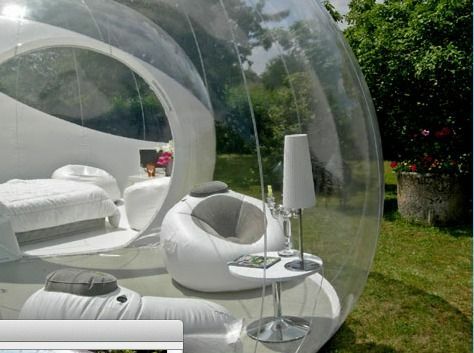 The main bubble is about 13 feet in diameter with enough room for a king size bed, and the other bubble is large enough for to be used as a dining room or sitting room. Experience life in a bubble!